Like normal, when my business travel hits, it often hits all at once! Over the last two weeks, I’ve been to Amsterdam, Cardiff (Wales), Milan, Dusseldorf and Wuppertal (Germany) and Helsinki via 7 planes, 8 trains, 7 taxis, 6 buses and 5 different beds that don’t quite have the comfort of my very own pillow under my head! Fortunately, alongside my work meeting schedules I was blessed to have met with a couple of church planters in various places along the way and had a divine conversation on the final plane ride back home last Friday with another who lives the world of business and business travel, while sharing Jesus along the way..even in board rooms! And the trip to Milan was over the weekend with Silas to have our first ever live Rugby experience, so it wasn’t all business! Needless to say, it’s been a wonderful week back home getting back into my “normal busy life” of 3 kids, a great dog, a wonderful church and plenty of face to face coffee (or kitchen) conversations with my best friend in life (and wife) Tanya! Although I didn’t get a chance to sit down and do my LIFT update for several days now, I had written this one “in my head and heart” last Thursday and Friday while looking forward to being home with my family. Of course, while traveling I don’t check out in life from my family, but stay engaged as much as possible. Great technology with a smart phone (voice, SMS and internet) helps a lot and skype with video from a hotel room can “almost” allow me to sit at the dinner table with the family and see and hear how their day went. Aside of technology, a far better way of staying connected (and the real point of this LIFT update) is the blessing and gift of God called PRAYER! It’s not out of date, it’s not irrelevant and it works beyond our expectations….even when we don’t think so! Somehow trying to grasp the magnitude of what prayer, in connecting to the God of the Universe from within my own soul and then realizing He enables my prayer of intersession (prayer on behalf of others) to touch other’s souls and lifes, gives me great joy and hope…….wherever I may find myself far from home! Prayer is not just intercession or asking God for things, but much much more (ie. praise, adoration, worship, confession, thanksgiving, song, meditation, to name a few)! Jesus reflected the father heart of God when He prayed for the disciples. As a father, or mother, you can pray that your children will focus on the five purposes of God. God’s five purposes for your children are the same as God’s five purposes for your life, and the same as the five purposes for the church. Jesus prayed for all five purposes in the lives of those He was leading. Jesus said, “I pray for them. I am not praying for the world, but for those You have given me, for they are Yours” (John 17:9 NIV). We can pray that our children will live for Christ joyfully: “I say these things while I’m still in the world so that they will have the same joy that I have” (John 17:13 GWT). We can pray that our children will grow strong spiritually: “I’m not asking You to take them out of the world, but to keep them safe from the evil one” (John 17:15 NLT). We can pray that our children will serve Christ effectively: “Make them ready for Your service through Your truth; Your teaching is truth” (John 17:17 NCV). We can pray that our children will experience fellowship personally: “My prayer . . . is that they will be of one heart and mind, just as you and I are one, Father . . . and the world will believe You sent me” (John 17:21 LB). We can pray that our children will bring others to Christ regularly: “I pray not only for them, but also for those who will believe in Me because of their message” (John 17:20 TEV). Even if you are not a father, or a mother, you will help others move toward the heart of God by praying for them and the purposes God has planned for their lives. This entry was posted in 2009, Encouragement, Prayer. Bookmark the permalink. A very full and very interesting week! How about you? As I write, I’m on a plane headed home from Istanbul, Turkey. For a guy who loves and appreciates church history, the highlight was Wednesday’s excursion into the heart of the city. My Italian boss, who also is a history buff, especially when it comes to the Byzantine empire, the crusades and the Ottoman empires, was also with me this week as we worked with our new Turkish partner (a Muslim by the way) in setting up his company structure near Istanbul. Istanbul was Constantinople prior to the 1400’s and a city originally established in the 330’s by Constantine who relocated his empire’s capital city from Rome closer to the Holy Land and obviously strategically located for east/west trading as well. 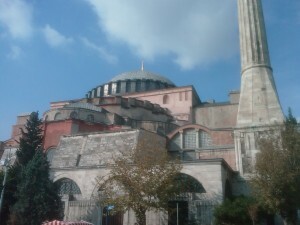 The Hagia Sophia, now a “museum” was a magnificent and massive church and focal point until 1453 when the Ottoman Empire (Muslims) conquered the city, renaming it Istanbul and making it the new capital city of their empire. The revered Sophia was converted to a mosque and considered a holy place for Allah and his followers for centuries. Only a few decades ago in the late 1900’s was it “secularized” and turned into a museum, now allowing world visitors/tourists to enter. In the process of secularizing the holy place for historical purposes, many of the original mosaics and works of art were uncovered, including those depicting Mary and the baby Jesus along side the huge writings of the Koran still hanging as well. An ironic contrast of the mixed history of such an important place. Walking a kilometer or so, we visited the nearby current Islamic holy place, the Blue Mosque, and entered the courtyard and eventually the mosque itself after the official prayer time (closed to non-Muslims) had ended. Something to note, Turkey, especially the west of Turkey, is quite westernized, even trying to get into the European Union, so with that in mind, even for such a holy and sacred Muslim location, this mosque is intentional to be Western friendly and to show the openness of Islam. However, it’s my understanding that the more East that one travels, the smaller the chance of Westerners gaining access into the holy places of prayer such as this. Regardless, for me, it was a rare and special opportunity for a Follower of Jesus to witness and observe first hand the blaring call to prayer from within a courtyard in which when full approximately 18,000 Muslims kneel to pray. 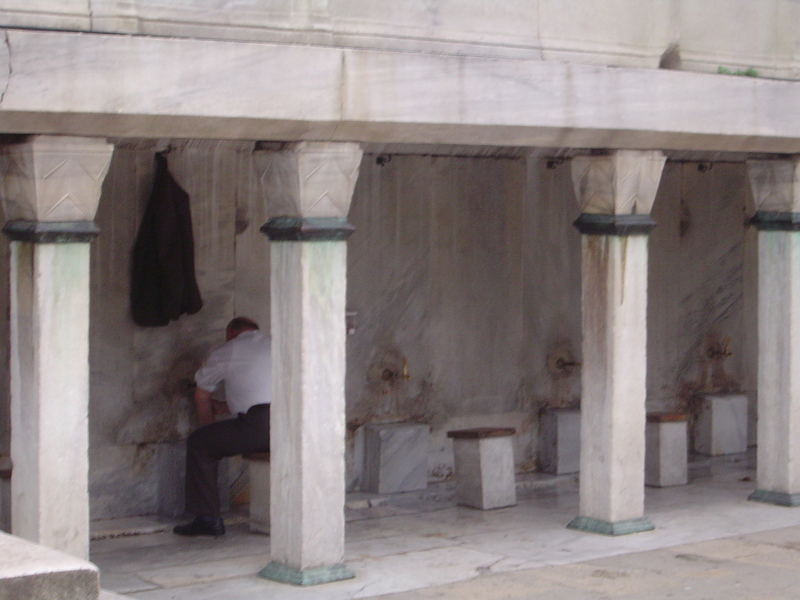 Just outside the courtyard, I could see the cleansing stations where men can sit and take of their shoes to wash their feet, their mouths and so forth in preparation to come into the presence of Allah in prayer. A friendly man (who wanted and later accepted my tip) explained the various points of cleansing (mouth, feet, head, etc 3x’s) before prayer. Most do it at home, but many do this cleansing at the Mosque as well. Of course, if one thinks bad thoughts, looks into a woman’s eyes with lust, etc, in the time from washing to entering the mosque, he must then repeat the whole process again. After the official prayer time ended, we were able to enter and walk around the huge carpeted mosque. Many were still coming and going for prayer, but the organized time (one of 5 daily) of all praying in unison was over. The women had their own sections at the side and surrounding areas of the main floor space. Something my boss had pointed out earlier was the lack of art and images, such as paintings of prophets etc that was in mosques. 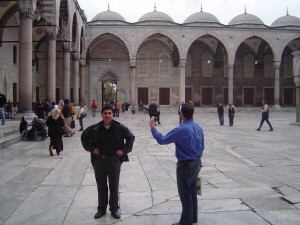 Instead, there are just large and decorate murals or banners with writings of the holy Koran. Sorry for the lengthy LIFT update this week, but even for myself, I wanted to write out my experience while it’s still fresh in my mind. 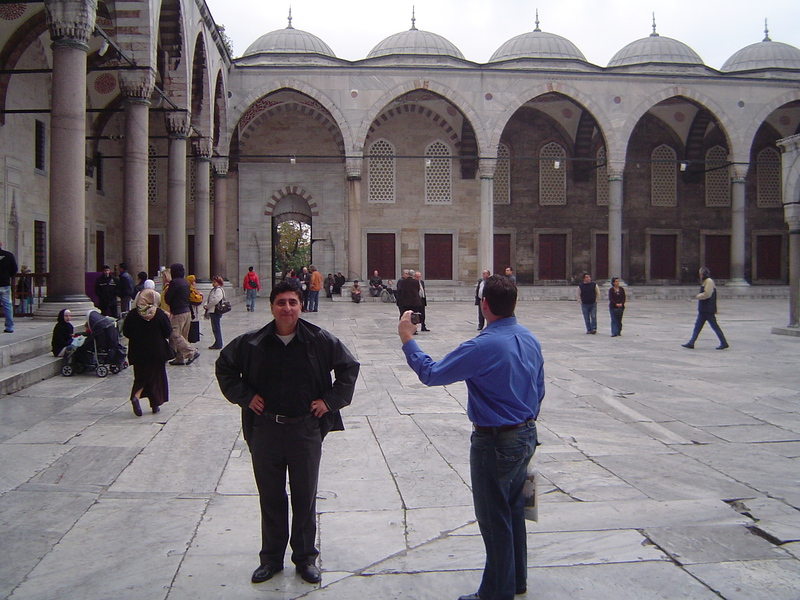 I found myself also praying while at the Blue Mosque, but to God the Father, in the Name of the Son, Jesus Christ by the power of the Holy Spirit! 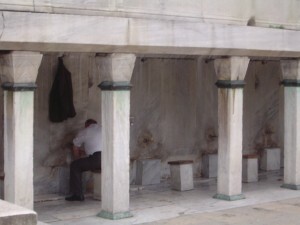 On one hand, I respect the deepness of the cleansing process in preparation of prayer that those people do, but at the same time, for most, it seems just a religious requirement that they thoughtlessly do because they have to (especially in the case of my business contact there, who only occasionally does the Friday prayers himself). One must admit, the Christian church has plenty of religious traditions that have lost the original Biblical intentions as well. Praise God that Jesus is our instant access to God; anytime and anywhere, with no church or “sacred” place needed, just us talking with God and including Him in our day, our actions, our thoughts and hearts! This too is prayer and what I believe Paul means when we are to pray without ceasing! (1 Thes. 5:17) Each morning, I was able to go down to the sea and spend time with my Lord Jesus and talk to God before a busy and tiring days of working (especially as this week I was the translator as our business partner speaks German, but not English). I’m so ready to be home with my family and very much looking forward to worshipping our Lord Jesus Christ at LIFT this Sunday with many of you. LIFT is a place that ALL are welcome, regardless of background, including other faiths such as Islam, while at the same time we will unashamedly teach and share the Gospel message of Jesus! So even during our worship services and time of prayer, folks don’t have to wait outside but can come inside to experience first hand what the God of Love is all about! PS: For those that desire more information about the faith and history of Islam, I can recommend a few books that I’ve read that share great insight, and in love strengthen understanding for dialog to share Jesus with Muslims; Unveiling Islam by Ergun Caner, Arabs in the Shadow of Israel by Tony Malouf, How Islam Plans to Change the World by William Wagner. Three Cups of Tea by Tom Anderson isn’t a Christian book, but great in cultural insight into the Islamic world. This entry was posted in 2008, Prayer. Bookmark the permalink. I for one had an incredible experience this past weekend during our A-Men retreat. To have 24 men of so many different backgrounds, cultures, languages and even social statuses together for a common cause, the cause of Jesus Christ, was astounding. Also putting aside the reality of our busy lives, marriages, families, jobs for a couple of days and realizing that we are not alone and that we have similar needs and grace from our Lord was quite eye opening (and heart opening too)! Either is was a past tense experience that was simply “touching to the soul” or it was the beginning of future experiences of taking actions to improve our relationship with God, our wives and/or families and others. I pray that it is the latter and that the encouragement and momentum carries forward and we are stronger men of faith and integrity in the days ahead! Thank you wives and kids for letting us get away for a weekend with intentions of growing our faith! Many thanks again to Gordon and Rean (and Sue and Liesl too) for coming all the way up from South Africa, using your personal vacation time to be so encouraging to us here in Swissland! May we continue to move ahead in the weeks to come, praying for each other, meeting with each other and worshipping our Lord Jesus Christ together! As the body of Christ, we need each other AND we are so blessed to have each other!!! This entry was posted in 2006, Encouragement, Prayer. Bookmark the permalink. It’s been a few weeks since I last wrote an update and I am excited to again, communicate the Message of our Lord Jesus Christ to all of you! LIFT is continuing our study on Prayer. 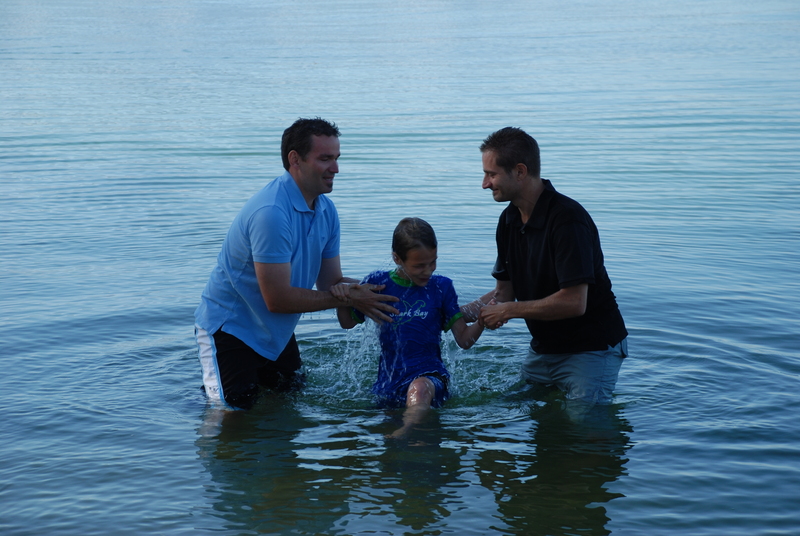 We are “THANKFUL” to Ken Eales for leading while my family and I were on vacation in the U.S. Speaking of THANKSGIVING…….. that just happens to be the focus of prayer this Sunday night. It’s important to give THANKS to God for what He has done! As praise is given to God for “who He is”, thanksgiving is given to God for “what He has done”. This Sunday night LIFT service is a bit special as we allow those of you who want to, the time to share something you are THANKFUL for! I invite you to come and be blessed and perhaps even share something God has done in your life! Furthermore, we will end the service by remembering and giving thanks to our God with the Lord’s Supper (Communion) for what He has given us. We serve a Risen God! This entry was posted in 2005, Prayer. Bookmark the permalink. THIS WEEK: WE CONTINUE OUR STUDY OF: What is PRAYER? For the summer months, we at LIFT will be “digging in” to the Scriptures about PRAYER! Does this passage below sound familiar? What does it mean? What does it mean to you? What prayers of praise?…watching?….waiting? Let’s find out together! Looking forward to growing in faith and prayer together! I’m off to Wuppertal, Germany in the morning and can’t wait to share in prayer on Sunday night back here at home!